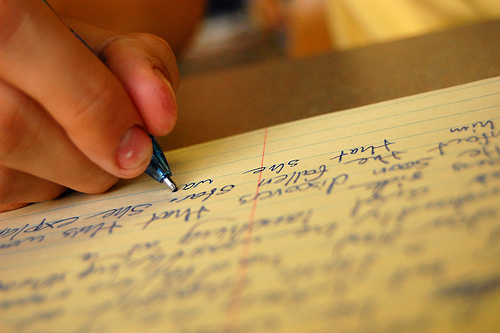 Most students are finishing up the school year right now, and the pressure is on. This coming weekend, my current class of Sommelier students will be taking their level 3 final exams. Talk about pressure. You can't imagine how much information there is to review and study prior to these final exams. As most of you know, not only am I a Sommelier, but I am a certified wine educator too. 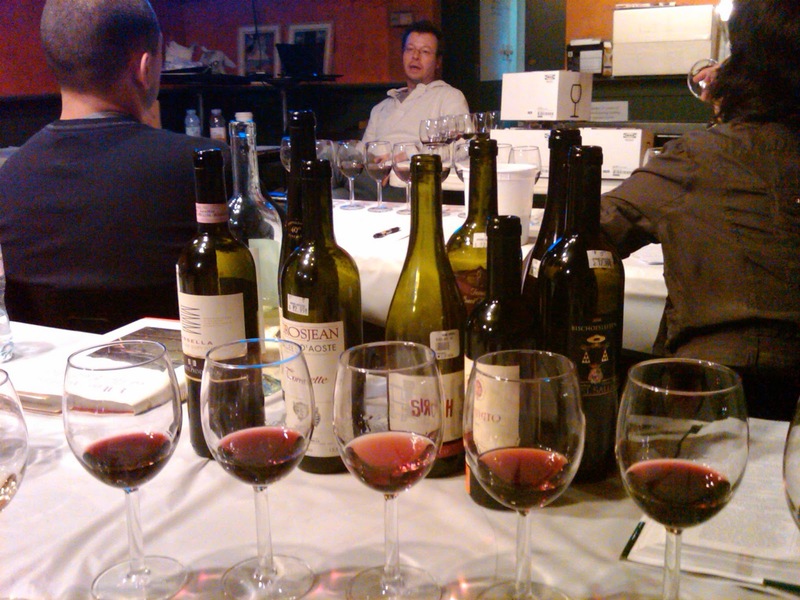 I have been teaching classes for the International Sommelier Guild (ISG) for the past couple years. I teach level 1 (beginner), Level 2 (intermediate or Wine Steward Certification) and Level 3 (Advanced Diploma, Sommelier Certification). My current class started their studies back in October, and minus a few holiday breaks, have been meeting every Sunday for 8 hour classes, over the past 8 months. We cover all wine subjects: viticulture, viniculture, tasting, service, regions, history and food pairing. The level 3 class has a number of exams that they will need to pass. A passing grade is 70% on each individual exam. If you don't get at least 70% on any of the exams, you will need to retake that particular exam to earn your certification. Compare and contrast the following wines: Brunello di Montalcino and Carmignano. Your commentary should include grape varieties, blending options, particular climatic influences, soil, vinification methods, and aging requirement. Compare the effect of climate, soil, vinification and grape variety on Marlborough Sauvignon Blanc versus Pouilly Fume. Describe the typical characteristics of each. Okay....now imagine having ten essays like that. The second exam has to do with food pairing and the job of a Sommelier. This is broken into two portions. The first is given at the midterms, and it consists of two short answer essay questions about restaurant service, staff training, and inventory control. The second portion of the exam is given as a final exam, and it consists of two wine pairing menus (classic menu and contemporary menu). Each menu has five courses (appetizer, appetizer, main, cheese, dessert). The students are required to suggest wines for each item (including name, vintage, grape) and justify their pairing. The classic menu requires one French wine and one other Old world wine for each course. The contemporary menu requires two new world wines for each course. Each course is a progression, so the choice of wines must be made so that each wine stands on its' own. The fourth exam is a blind tasting. Not just any blind tasting, but 22 wines/spirits. The first round will consist of 3 sparkling wines, then 6 white wine, 6 red wines, and 7 other beverages (including spirits, beer, fortified wines, and 2 faulty wines). They must write down accurate tasting notes including appearance, nose, palate, and their conclusion as to the grape, country and subregion. Again, 70% accuracy is required to pass. The fifth and final exam is a 200 multiple choice exam. While this might sound easy, there is so much subject matter that can be covered here, it is virtually impossible to anticipate all the potential questions that could be asked. For example, how would you do on these questions? 1. The term appassimento refers to what process in the production of Amarone della Valpolicella DOC? 2. What is the difference Between Le Montrachet and Chassagne-Monhachet? 3. Which of the following terms translates as “pure rice sake”? Are you ready to become a Sommelier? Ever dreamed of being one? Then you need to read a lot, and start taking courses. It is a long road, but a great education and payoff. You just need to be able to handle the stress of the exams. Good luck to my students this coming weekend. 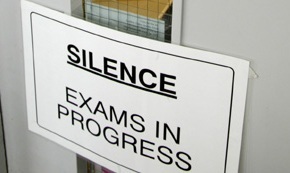 You have all studied hard, and should be well prepared to pass the two days of testing. My mother-in-law loves her sparkling wine, so it only made sense that on Mother's Day, we do a sparkling wine dinner. 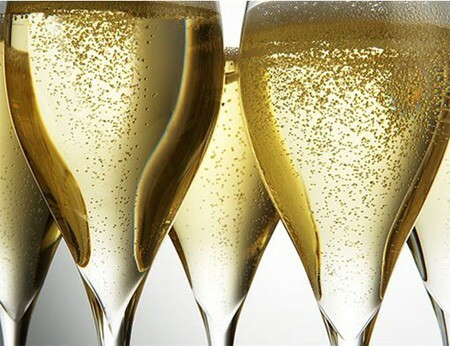 Now I have written about sparkling wines before, and hope I made my point that Champagne is a sparkling wine, but not all sparkling wine is Champagne, hence the title of this article. I didn't serve Champagne, but it was a pretty good substitute....more on that later. The one constant with sparkling wines is that they have bubbles, and they are acidic. The bubbles are great for cleansing the palate. They work great with salty and fried foods, as well as mouth coating foods like eggs, and cheese. For this dinner, my focus was more on the acid. When working with acidic wines, acid pairs with acid. For the first course, I decided to go with a salad. Strawberries pair well with sparkling wine, but I also wanted a green salad with a vinegar based salad dressing. 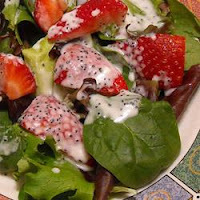 I found a recipe online for Strawberry Romaine salad, but the key to the salad was the poppy seed dressing made with vinegar and mayonnaise (sounds odd, but believe me, it worked). I paired this with a Gruet Blanc de Blancs. 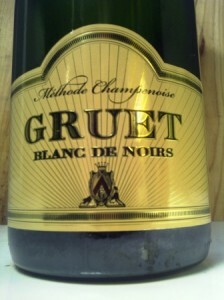 Gruet is one of those sparkling wines that you need to try (if you can find it). Of all places, it comes from New Mexico, and for about $15/bottle (non-vintage), it is a great value. It is not too yeasty, but is made in the Champagne method, so that autolytic character is there. About two years ago, the Wine Spectator named it #43 in their top 100 wines, and since then it has been a bit difficult to find. Originally, I had planned on doing a seafood dish for the main course, but my youngest son surprised us with a visit for the weekend, and he doesn't eat fish. 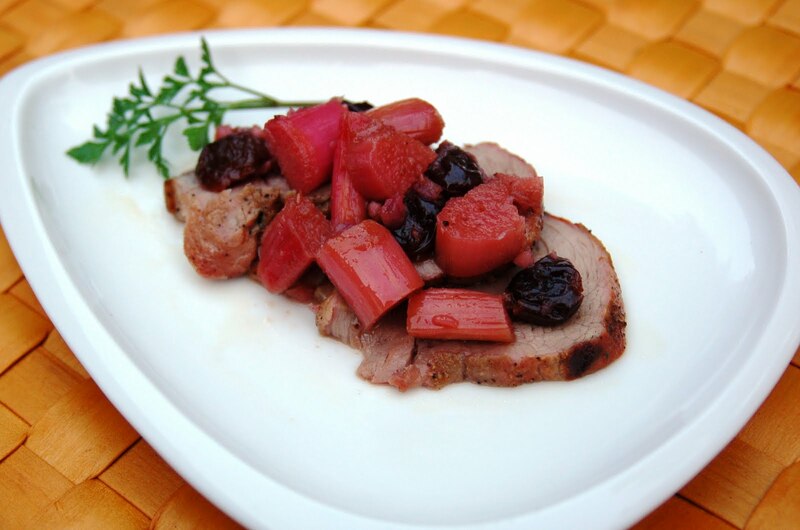 With a quick change of plans, I found a pork tenderloin recipe that would work great with the Gruet Blanc de Noirs. Pork is one of those meats that can work with whites or reds, so I went with a white wins, made from red grapes (blanc de noirs). The pork tenderloin was served over mashed potatoes with a rhubarb/currant relish, made with cider vinegar (there's that acidity again). You've got to try this recipe. I would serve this with a Riesling or a cool region Pinot Noir as well as a sparkling wine...great pairing! I finished the meal with a trifle. I wanted to do something with some lemon in it, but was looking for something a bit different. 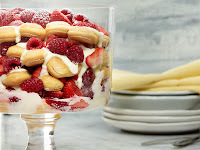 This recipe is a play on Tiramisu, in that it uses lady fingers (and if you have trouble finding them like I did, you could use Nilla cookies). In this case, the lady fingers are soaked in homemade lemonade. This is a real simple recipe, and really good. I paired this with a Gruet demi sec (semi sweet sparkling wine that works well with a little sugar). I love to cook (just wish I had more time to do it), and I love to pair wines for the meal. If you are like me, give these recipes a try, and seek out some Gruet (or your favorite sparkling wine). The whole idea is to have fun with food and wine. Enjoy! Over the last few years, I written about wines from around the world. We've gone over growing the grapes, making the wine, how to taste, and discussed how store your wine, taste it, and pair food with it. But, we haven't gone over how to get the wine out of the bottle. When you have a screwcap, that's pretty simple, however, most wine still comes with a cork. I'm sure most of you have seen the Youtube video of the guy opening a bottle with his shoe. I suppose you could do this, but you'll certainly be shaking up all the sediment along with the wine...not ideal when you easily carry an opener with you. There are so many different types of openers, and there is no way I can cover them all here, but I will touch upon the best known. The main components needed to open a bottle of wine are something to cut the foil, and something to extract the cork. Cutting the foil can be done with a knife, or a foil cutter. Extraction of the dork can be accomplished with many different approaches. The original extraction tool was a simple auger or worm, with a handle that was screwed into the cork, then pulled, using muscle power. The process was improved by taking advantage of leverage. 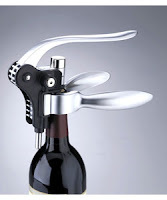 The "butterfly" corkscrew is what I remember my parents using. The worm is screwed into the cork, and as it is, the "arms" move into an upward position. When pushed down, the cork is removed. This style requires an additional foil cutter, but does come with a bottle cap opener. The lever-pull (also known as a rabbit) is an improvement on the butterfly. 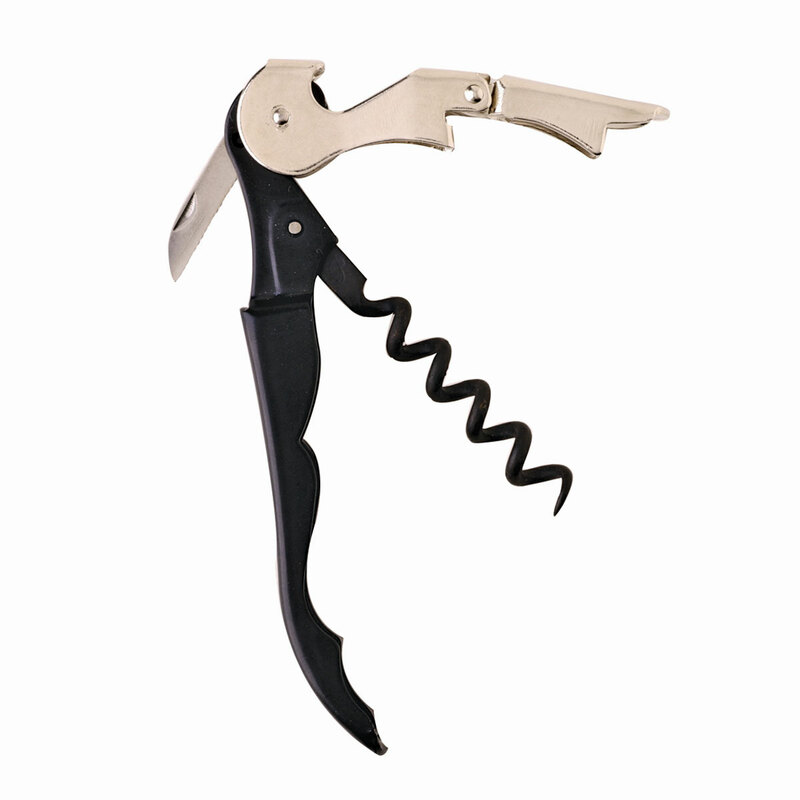 This type of corkscrew relies on gear. Once clamped on the neck of the bottle, the gears drive the worm into the cork, and by lifting the handle, the cork is easily extracted. This type also requires a separate foil cutter. The disadvantage is that it is bulky, and can be pretty expensive. One of the newer types of "corkscrews" doesn't even have a worm. These cork extractors use compressed air, or even CO2 cartridges. A "needle" is inserted into the cork, and the gas is pumped into the bottle, where the pressure pushed the cork out. Because this type of extractor requires that you push through the cork, they can add sediment to your wine. Also, if you have a tight cork, built up pressure can actually break off the neck of the bottle. While I have never seen this happen, it has been reported. One of the older types of extractors also doesn't have a worm. Some refer to this type as the "two-prong" or "butler's friend", but I have always known them to be called "ah-so". 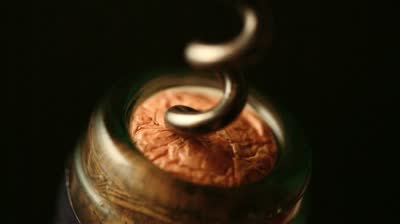 The two prongs are inserted between the cork and bottle, then twisted and rocked, removing the cork. This type of extractor was designed to remove corks from Port wine bottles that might have a lot of sugar coating the cork, forcing it to stick to the bottle, By inserting the prongs, and twisting, it would scrape off any residual sugar, releasing the cork. I've tried them all, but I continue to use my trusty Waiter's Corkscrew. This style takes some practice, but once you master it, you'll find it very easy to use. 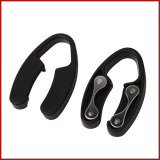 I prefer the double hinged style,which allows for different levels of leverage. It also has a good serrated foil cutter, and a teflon worm that is not too thick. It easily fits in a pocket, and is comfortable in my hand. There are cheap versions, and expensive versions. I paid about $60 for mine and it has lasted years...definitely worth the investment! When I do come across the occasional broken cork, I can usually get the cork out with this style of corkscrew, or sometimes have to resort to a combination of my waiter's corkscrew and an ah-so. As mentioned in the beginning, there are many different ways to get the cork out of the bottle. I am a believer in keeping the "romance" of opening the bottle. As a Sommelier, that is part of my job. We are also trained to open the bottle as quietly as possible. You shouldn't hear the cork popping. The cork should come out in one piece, allowing for examination of the cork (type...don't smell the cork, it won't tell you anything. But, do look at it for potential leakage or mold). However you open your wine, the goal is the same: to release the liquid art inside the bottle. Beer - What's the difference? It's been two years since I wrote about beer production, so it's probably about time I circle back around, and satisfy my beer loving friends. 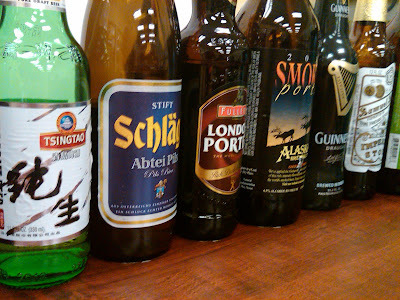 Last weekend, my advanced Sommelier class to a break from wine study, and we spent the day reviewing beer, cider and sake. As we worked our way through over twenty beers, it was evident that there is some confusion as to beer styles, versus beer types. Read on, and hopefully I'll make myself clear. When studying beer, the process is important, and one of the things a brewer must determine is what type of yeast to use. 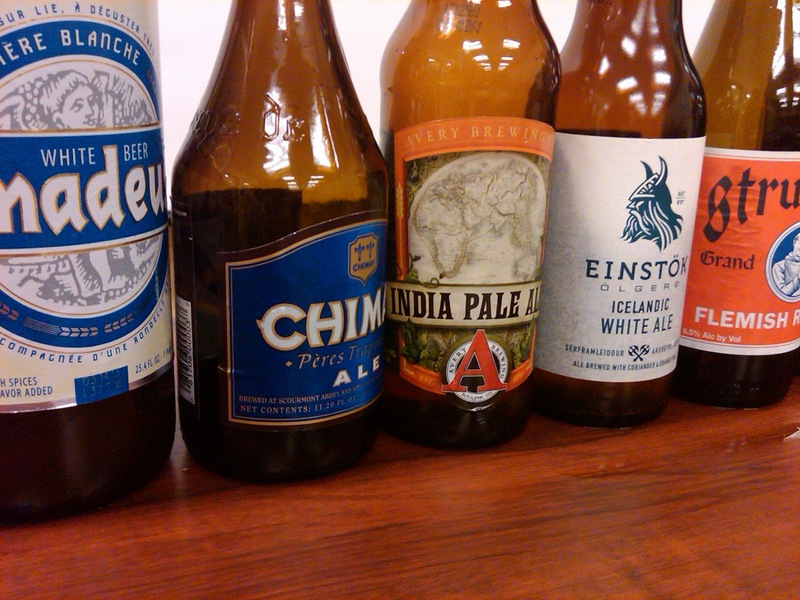 In most beer courses, you will learn that there are two types of beer: Ale and Lager. I'll argue that there is a third: Lambics. What is the difference between these three? 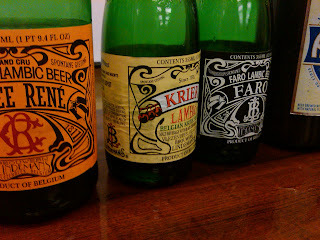 First, Lambics are beers that are fermented with wild yeasts. There is no control over the types of yeasts, and the beers might also pick up ambient micro-organisms (brettanomyces and bacteria) which create this unique, sour beer. The typical flavor profile is dry, sharp, and sour. Sugar (faro) and fruit is often added to balance the sourness of the beer. 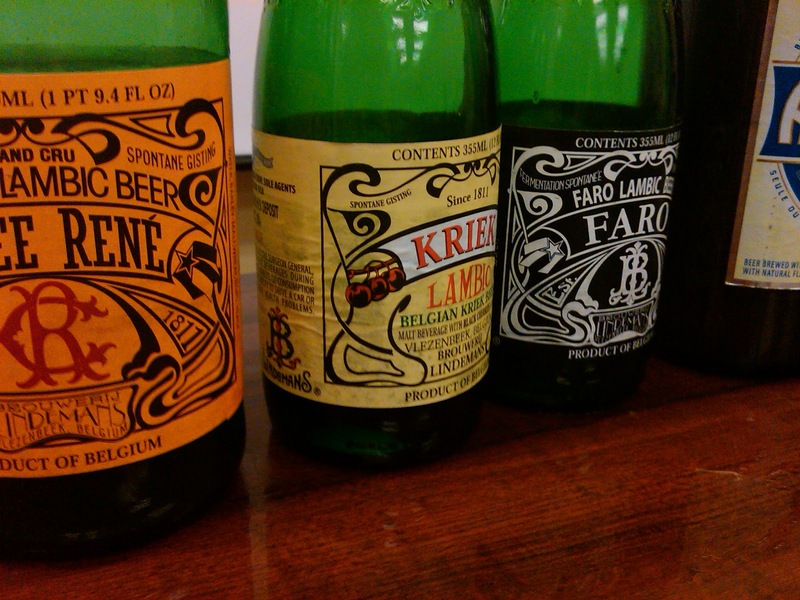 Lambics are probably the original beer. Lagers really didn't come into being until the 19th century, when Emil Hansen (a brewer at Carlsberg) followed up on work done by Louis Pasteur, and isolated a pure yeast culture that fermented at the bottom of the barrel, and at cooler temperatures (39 to 48 degrees) than ale yeasts. These yeasts also take longer to ferment, producing dryer, cleaner, rounder beer with less complexity than ales. As a result of their cool fermenting yeast strains, Lagers have less yeast derived flavors, allowing for a clearer expression of the hops and grain. The word "Lager" comes from the German word "Lagerung", meaning storage, due to the long storage periods required for these types of beers. So, depending on how you look at it, we have two or three types of beers, but that doesn't explain the styles. When it comes to styles, there are two many to discuss in a small blog like this. Heck, there are thick books written on the subject, but let me summarize a bit....there are light, pale, hoppy, malty, chocolaty, fruity, wheat, rice, corn, barley...well you get the point. Each one tastes different. In Belgium alone we find Lambics, Hoegaarden, Red Ale, Gold Ale, Trappist, Abbey, Saison (all ales) as well as Belgian Lagers. Where Belgium is mostly known for ales, Germany is known for Lagers, like Dunkel, Vienna-style, Helles, Dortmunder, Bock and Doppel Bock. Then there are those beers that can be made either way: Altbier and Kölsch. 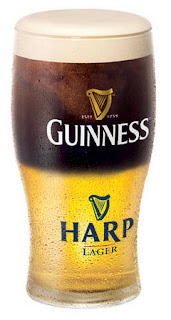 Most British beers are Ales: Bitter, Pale Ale, IPA (India Pale Ale), Barley Wine, as well as heavier beers like Porter and Stout. Americas most popular (at least as far as sales go) are Coors, Budweiser, and Miller - all lagers. For those of you who have read this far, I've got a couple fast facts about beer, that you can share with your friends. 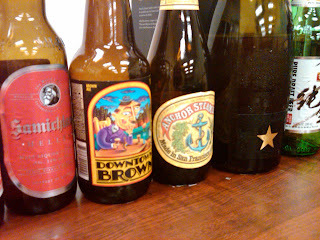 : 1) In the middle ages, beer was the poor mans drink, but essential to their health, as it provided vitamins and minerals, and the alcohol killed bacteria that was prevalent in the water; 2) Beer makes up 85% of all alcohol consumed in the United States; 3) China is the largest producer of wine in the world; 4) Darker beers are usually lower in alcohol and calories than lighter beers, due to the malting process, which toasts the grains, and accounts for the amount of sugars available for fermentation; and lastly 5) Ever wonder why beer is more popular among males versus females? Sour and bitter tastes trigger built-in genetic warning signs in humans that help us spot potentially poisonous foods and liquids. These senses become more acute in pregnant and nursing women, which may explain the stylistic beer preferences of men and women.